Recently I asked some secondary teacher friends if they had ever heard of Teachers Pay Teachers, the teacher-to-teacher resource site where millions of teachers buy and sell curriculum. “What’s that?” Blank looks. Confused stares. While TPT has taken off like a rocket in the primary grades, many high school teachers still don’t know it exists. And it’s a rotten shame, for them and for their students. You could do something about that, dear administrators. Let me establish some credentials here before I make my argument. I have worked in three high schools, one on the West coast, one on the East coast, and one abroad. I have taught all four grades, and worked with regular and honors students, students struggling with English and student body presidents. I have my B.A. from Pomona College, my M.A. from Middlebury. I’ve attended a slough of professional development workshops and had my work published in the English journal, Independent School Magazine, Classroom Notes Plus, readwritethink.org and Reading Today. I have spent hundreds of hours reading about pedagogy and examining what there is to offer teachers in terms of internet resources. I’m not new to education. I discovered TPT when I took some time off from teaching to stay home with my young children. Looking at the curriculum packets, filled with careful instructions for teachers, rubrics, examples and attractive handouts, I couldn’t help but remember my first year in the classroom. Desperate for ideas, I spent all my free time that year at the Los Angeles library and Barnes and Noble, trolling the education shelves for relevant, interesting inspiration. I read many wonderful books, including Why Read?, by Mark Edmundson, and The Courage to Teach, by Parker Palmer. I read about differentiated instruction, the differences between boys’ and girls’ brains, independent projects and portfolios, the role of active learning. But almost none of it was directly applicable to the next day’s lesson. And the clock was always ticking. I turned next to conferences, attending the National Council of Teachers of English conference and a retreat for new teachers in Northern California. I was inspired by much of what I found, and I eagerly snapped up the packets of materials teachers shared with me. I researched further online, learning more about new pedagogies like Harkness and literature circles, and finding inspiration at teacher sharing sites like Outta Ray’s Head and Web English Teacher. All of this I considered to be the natural hard work of the English teacher. By finding inspiration in the work of other teachers, I felt I was giving my students the very best I could. After all, I was new. Surely I had much to learn. I designed tons of my own curriculum, but I also adapted the ideas of others who were willing to share. Is that the teacher’s version of plagiarism? Was I unoriginal? Not hardworking enough? Ha! I often spent fourteen or sixteen hours a day working, trying desperately to produce the best possible curriculum for my students with little or no guidance from my school administration (no offense meant). So here we get to the crux of the issue. Teachers Pay Teachers. Not only should secondary teachers not feel guilty for going online and buying the curriculum designed by those who have come before, school administrations ought to consider budgeting for just this. My school was happy to buy dull, canned books of vocabulary activities for my students. They were happy to fund a packet of Macbeth worksheets designed by a big name publishing house. They didn’t mind if I used the poetry slam materials designed by other teachers and shared with me at national conferences. How is TPT any different? Besides, of course, that it is WAY better. 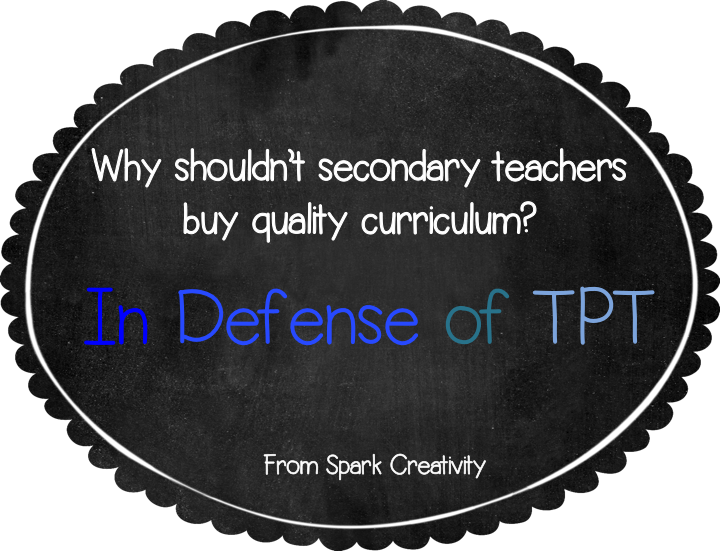 As open markets so often do, TPT has inspired teachers to create more and better curriculum than ever before. On TPT, teachers can find not just thorough, attractive lesson plans, but the associated rubrics, models, bulletin board headers, and parent info that only teachers realize other teachers need. 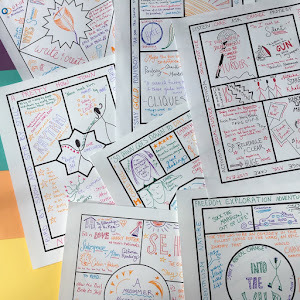 Want your teachers to help students create interactive notebooks but they don’t know how? No problem. Want to improve classroom dynamics in classrooms but have no idea where to begin? TPT can help. Wishing your English department could make grammar more fun? You’re not the only one! Teachers with new classes won’t have to stay up all night for the first month trying to get ahead, and teachers who are finding material stagnant after ten years can find fresh ideas and inspiration. Administrators, rejoice! Not only should administrations encourage teachers to shop for TPT resources to supplement their original curriculum, they shouldn’t be afraid to let their teachers become sellers. My ability to design thorough and relevant curriculum has only improved since I began to share my materials through the site. I look forward to returning to the classroom with hundreds of pages of ready-made activities in hand. Plus, after networking with other TPT sellers on Twitter and Facebook, I have an even more extensive repertoire of pedagogy knowledge. Members of the community are constantly sharing ideas and articles as well as products via these channels. 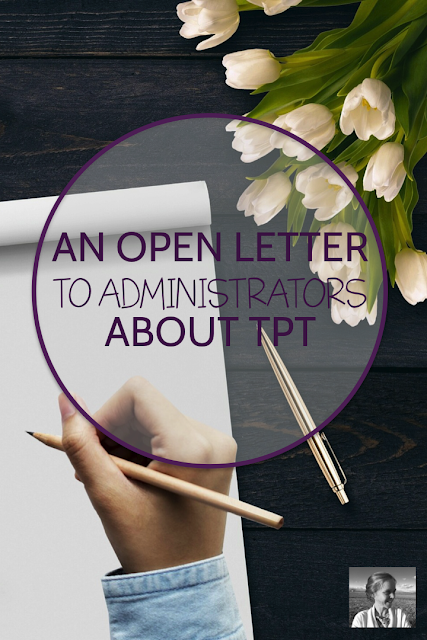 So, administrators, tell your teachers about TPT. Give them fifty dollars to spend there and see what happens. You’ll be amazed at what they can find for less than the price of a single textbook. And teachers, don’t be afraid to approach your administration and ask. If they don’t know what you’re talking about, give them this letter. Or make your own case; I’m sure you’ve got a similar story to share. Millions of teachers are engaged in the TPT community, and we are proud to be part of it. It’s a new frontier in education, and it’s a good one.